IP Office Server Edition is the ideal solution for midsize businesses, delivering intelligent Unified Communications, scalable growth and seamless management. Server Edition enables businesses to quickly and easily add users to an existing office or even connect a remote office, all from the central HQ. A Linux server is the heart of Server Edition, running IP Office software, Voice Messaging and Unified Communications (Avaya one-X Portal for IP Office). Server Edition delivers true Centralised Management and Licencing for all users, across all locations, in one, intuitive, Graphical User Interface. 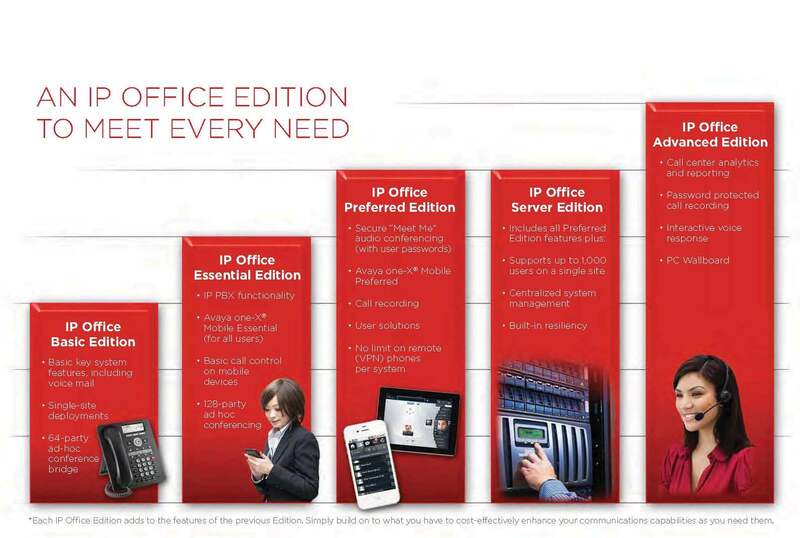 IP Office Server Edition enhances the capability of Preferred Edition … and more! Centralised Management – Simple administration is the cornerstone of Server Edition. From the one intuitive interface, the System Administrator has one view of all users on a single site or across up to 32 locations. Using system status can, at a glance, let the Administrator know of any potential issues that could affect system performance such as over utilisation trunk lines, voice ports and bandwidth utilisation.